The U.S. Department of Agriculture recommends 2 to 3 cups of vegetables per day for adult men and women. Blending fresh vegetables, such as spinach, to make juice is a simple way of meeting your recommended daily vegetable requirement. 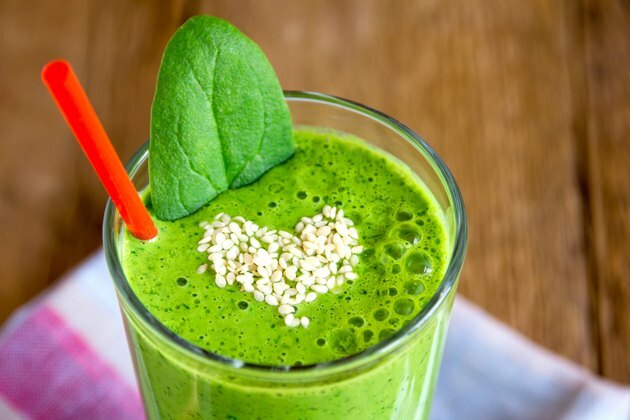 Making spinach juice in a blender allows you to keep all of the dietary fiber of the vegetable, unlike with a juicer, which filters out the fiber. Rich in a variety of nutrients, it takes 4 cups of fresh spinach and 1 cup of water to make 1 cup of blended spinach juice. A single 1-cup serving of fresh spinach juice has only 28 calories. With less than 1 gram of fat for the same size serving, this makes spinach juice a low-calorie, low -at drink that is rich in a number of nutrients. The same size serving of fresh, blended spinach juice also contains almost 3.5 grams of protein and only half a gram of sugar. A single serving of spinach juice made in a blender contains 2.6 grams of dietary fiber. The dietary reference intake for adult men is 38 grams of dietary fiber per day. The amount drops to 25 grams for adult women, and 28 and 29 grams for women who are pregnant or breast feeding, respectively. According to Colorado State University, the majority of Americans do not receive enough dietary fiber in their daily diet. Fiber provides bulk to your diet, making you feel fuller faster, encouraging you to consume less and reducing the risk of overeating. Dietary fiber also adds bulk to your stools, reducing the risk of constipation as your stool pass more easily with the extra bulk. A single serving of blended spinach juice contains almost 580 micrograms of vitamin K, well over 100 percent of the daily adequate intake. The daily AI for adult men and women is 120 and 90 micrograms, respectively. Vitamin K is also known as the clotting vitamin, as it helps your blood coagulate. Low vitamin K levels can lead to abnormal bleeding and bruising and difficulty healing from even minor cuts and scrapes. Vitamin K also helps with the absorption of calcium, so it aids in keeping your bones and teeth strong and healthy. A single serving of fresh spinach juice contains 119 milligrams per serving, which is almost 12 percent of the recommended dietary allowance. The RDA for calcium, according to the Linus Pauling Institute, is 1,000 milligrams for adults. Calcium is an essential mineral that helps with building healthy bones and teeth. A consistent lack of calcium in your diet can lead to soft bones, also known as osteoporosis. Calcium also helps with muscle and blood vessel contractions, as well as with transmitting information through your nerves. U.S. Department of Agriculture: How Many Vegetables Are Needed Daily Or Weekly? What Juices Can Cleanse Kidneys?